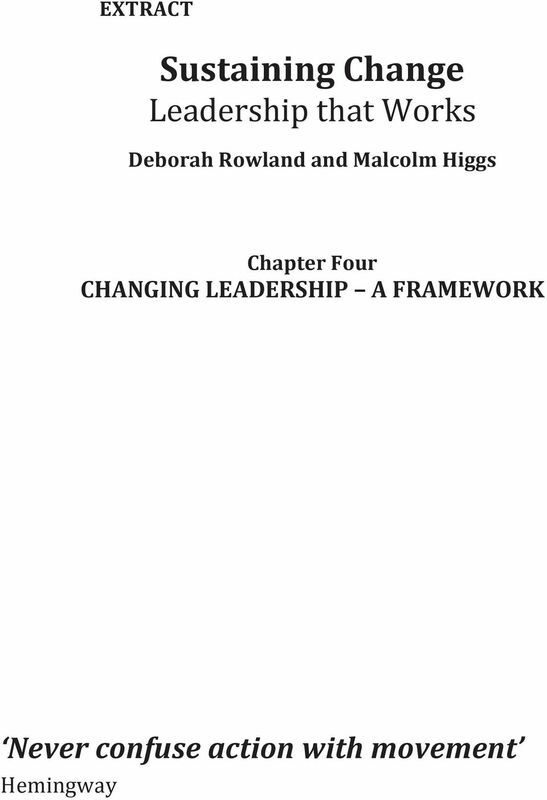 Download "By DEBORAH ROWLAND and MALCOLM HIGGS"
2 By DEBORAH ROWLAND and MALCOLM HIGGS A huge amount of change initiatives fail. 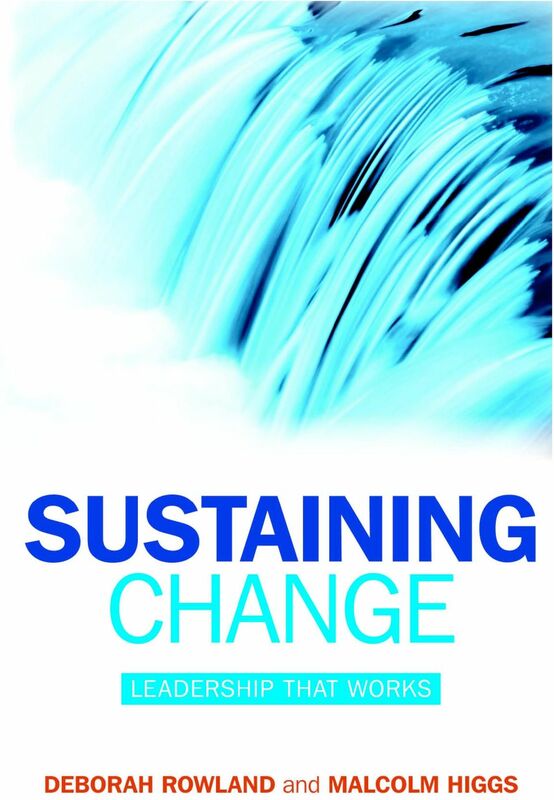 Based on a combination of 4 years rigorous research and practical application of the emerging ﬁndings, the book explores the dilemmas related to the growing need for change and the difﬁculty in making change work. 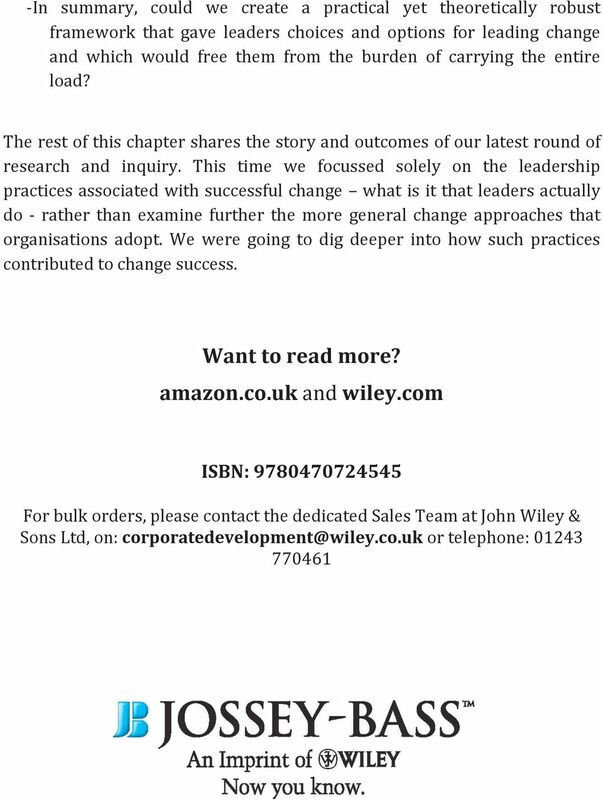 With empirical research of leaders in some of the most successful global organisations including PwC, Starbucks and Shell, this book will enable organisations and their leaders to make substantial performance improvements. 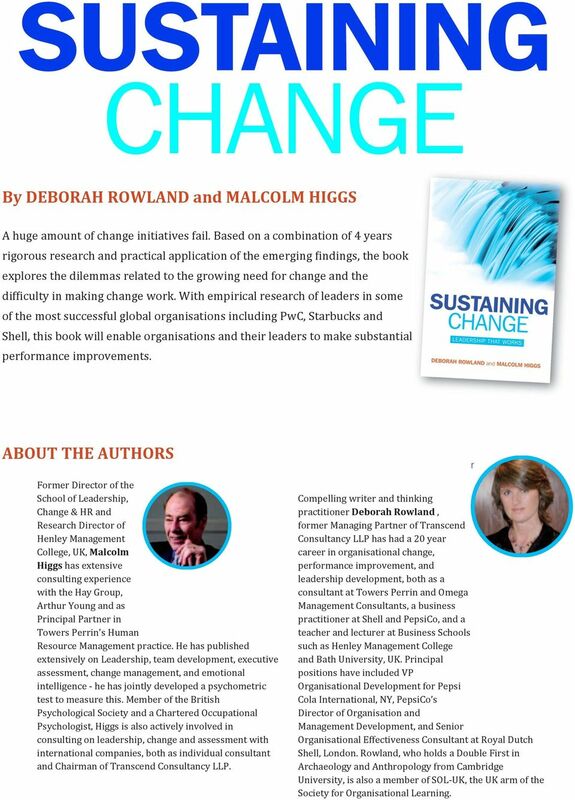 ABOUT THE AUTHORS Former Director of the School of Leadership, Change & HR and Research Director of Henley Management College, UK, Malcolm Higgs has extensive consulting experience with the Hay Group, Arthur Young and as Principal Partner in Towers Perrin s Human Resource Management practice. He has published extensively on Leadership, team development, executive assessment, change management, and emotional intelligence - he has jointly developed a psychometric test to measure this. Member of the British Psychological Society and a Chartered Occupational Psychologist, Higgs is also actively involved in consulting on leadership, change and assessment with international companies, both as individual consultant and Chairman of Transcend Consultancy LLP. Compelling writer and thinking practitioner Deborah Rowland, former Managing Partner of Transcend Consultancy LLP has had a 20 year career in organisational change, performance improvement, and leadership development, both as a consultant at Towers Perrin and Omega Management Consultants, a business practitioner at Shell and PepsiCo, and a teacher and lecturer at Business Schools such as Henley Management College and Bath University, UK. Principal positions have included VP Organisational Development for Pepsi Cola International, NY, PepsiCo s Director of Organisation and Management Development, and Senior Organisational Effectiveness Consultant at Royal Dutch Shell, London. Rowland, who holds a Double First in Archaeology and Anthropology from Cambridge University, is also a member of SOL- UK, the UK arm of the Society for Organisational Learning. 8 when mapped can be startlingly simple. At its most straightforward, the study of complexity is the study of the dynamics of the diverse linkages and interactions among people, technology and systems over time. This dynamic approach conceptualises organisational systems as sets of agents, or individuals, processes and mechanisms that generate novel and emergent outcomes from the interaction of the agents. We knew that a Shaping leadership style did not generate novel and emergent outcomes. 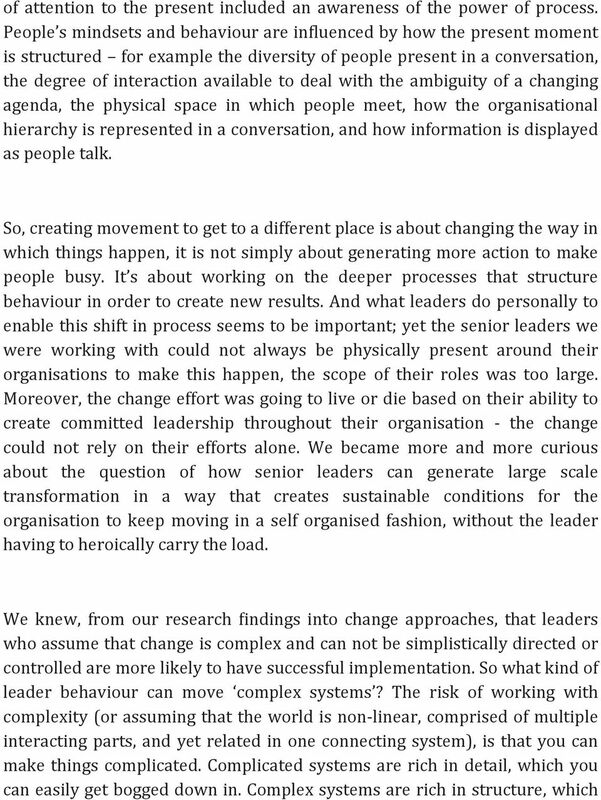 A combination of this leader- centric behaviour, and a mechanistic change approach, seemed to generate a stuck organisation, not a healthy adaptive one. When individuals take charge, others around them stay frozen. 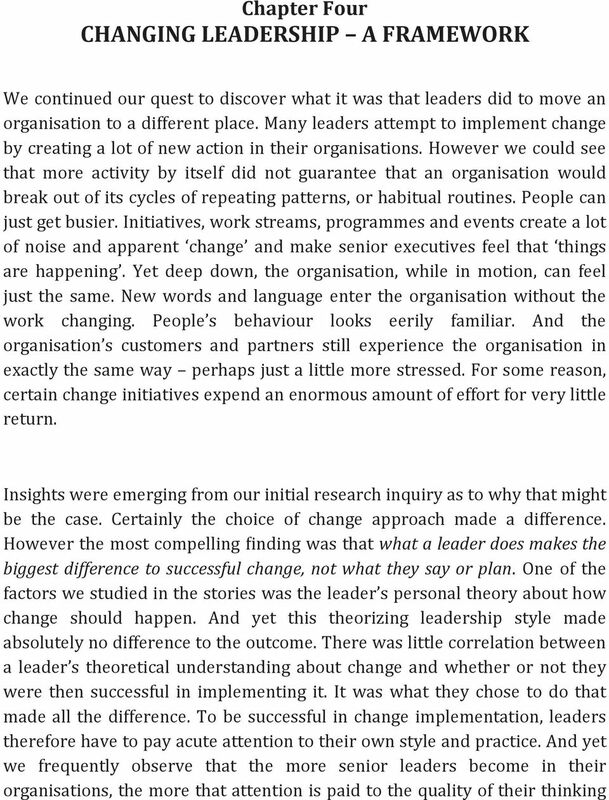 They abdicate their own responsibility for making change happen and put that onto the Shaping leader. 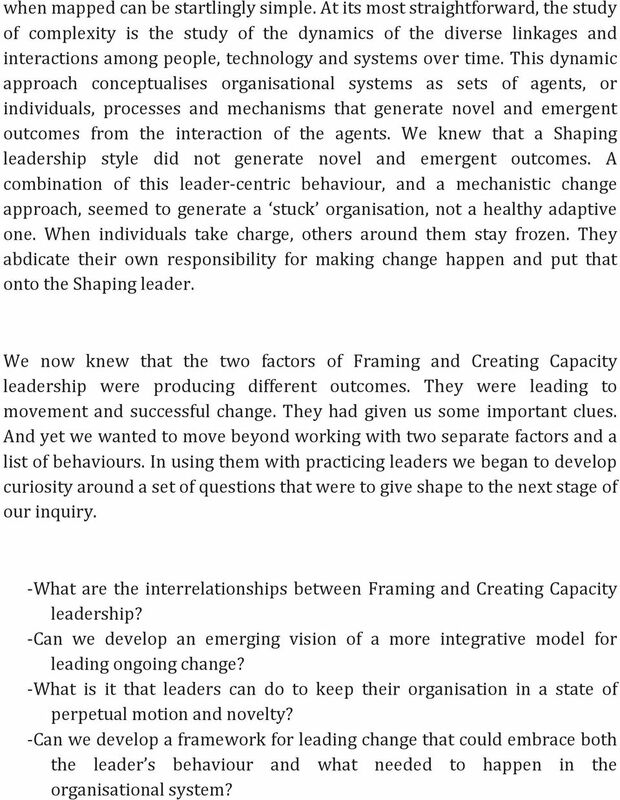 We now knew that the two factors of Framing and Creating Capacity leadership were producing different outcomes. They were leading to movement and successful change. They had given us some important clues. And yet we wanted to move beyond working with two separate factors and a list of behaviours. In using them with practicing leaders we began to develop curiosity around a set of questions that were to give shape to the next stage of our inquiry. - What are the interrelationships between Framing and Creating Capacity leadership? 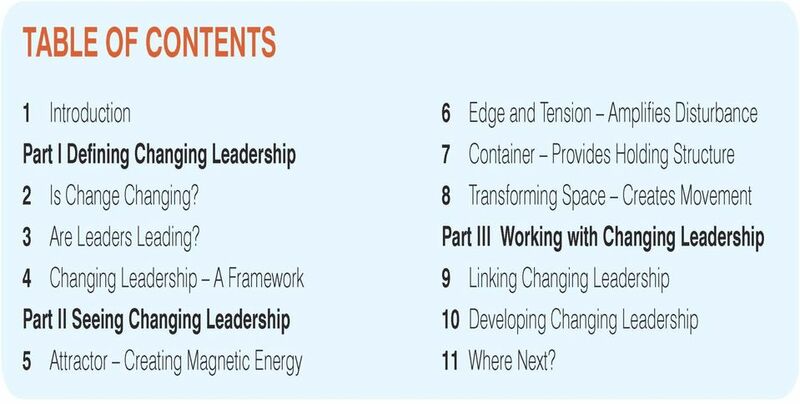 - Can we develop an emerging vision of a more integrative model for leading ongoing change? - What is it that leaders can do to keep their organisation in a state of perpetual motion and novelty? 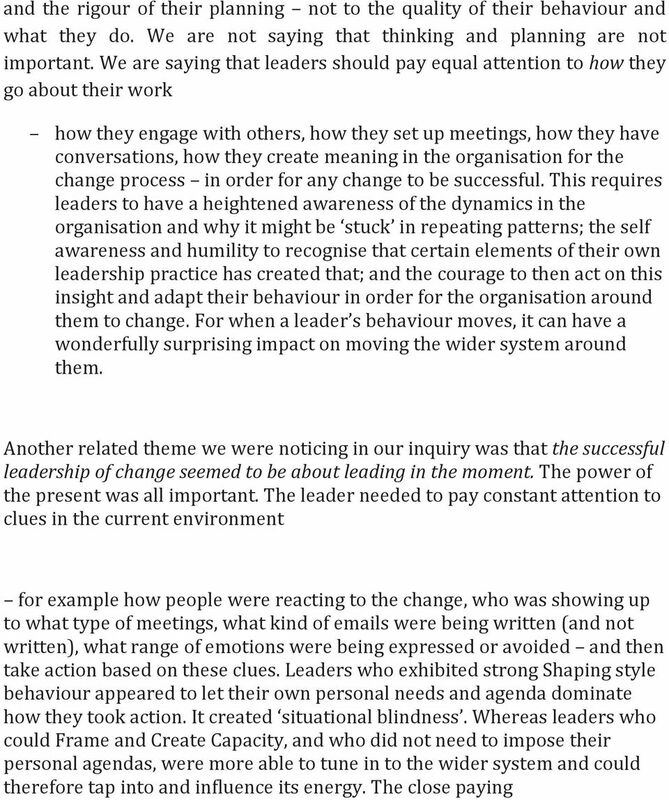 - Can we develop a framework for leading change that could embrace both the leader s behaviour and what needed to happen in the organisational system? What can 360 Feedback data tell us about the differences between male and female leaders? 3. Personal Statement Standard 1: A registrant must maintain a continuous and up-to-date and accurate record of their CPD activity.